// This function adds a time band to the image. 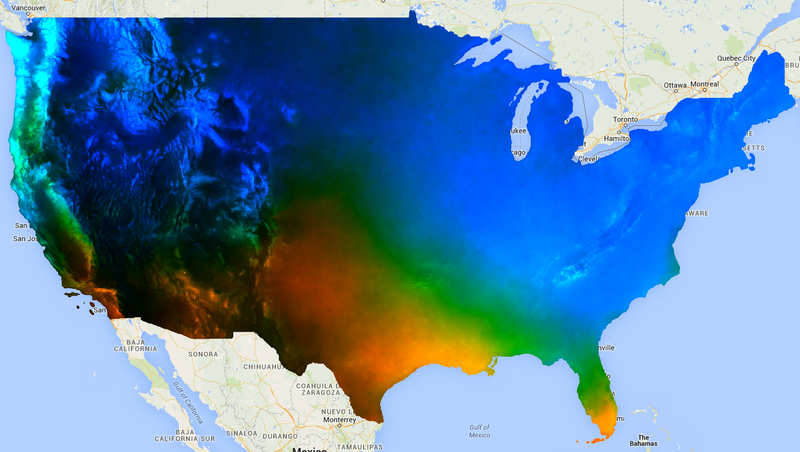 // Load the input image collection: projected climate data. // Map the time band function over the collection. Observe that the output contains two bands, the ‘offset’ (intercept) and the ‘scale’ ('scale' in this context refers to the slope of the line and is not to be confused with the scale parameter input to many reducers, which is the spatial scale). The result, with areas of increasing trend in blue, decreasing trend in red and no trend in green should look something like Figure 1. Figure 1. The output of linearFit() applied to projected precipitation. Areas projected to be increased precipitation are shown in blue and decreased precipitation in red. For a more flexible approach to linear modelling, use one of the linear regression reducers which allow for a variable number of independent and dependent variables. Specifically, ee.Reducer.linearRegression() implements ordinary least squares regression (OLS). Alternatively, robustLinearRegression() uses a cost function based on regression residuals to iteratively de-weight outliers in the data (O’Leary 1990). // Scale milliseconds by a large constant. // This function adds a constant band to the image. // Map the functions over the collection, to get constant and time bands. // Select the predictors and the responses. // Compute ordinary least squares regression coefficients. // Compute robust linear regression coefficients. // The results are array images that must be flattened for display. // These lists label the information along each axis of the arrays. var bandNames = [['constant', 'time'], // 0-axis variation. ['precip', 'temp']]; // 1-axis variation. // Flatten the array images to get multi-band images according to the labels. // Display the OLS results. Inspect the results to discover that linearRegression() output is equivalent to the coefficients estimated by the linearFit() reducer, though the linearRegression() output also has coefficients for the other dependent variable, tasmax_mean. Robust linear regression coefficients are different from the OLS estimates. The example compares the coefficients from the different regression methods at a specific point.